On March 13, White House welcomed 40 Intel Science Talent Award finalists. 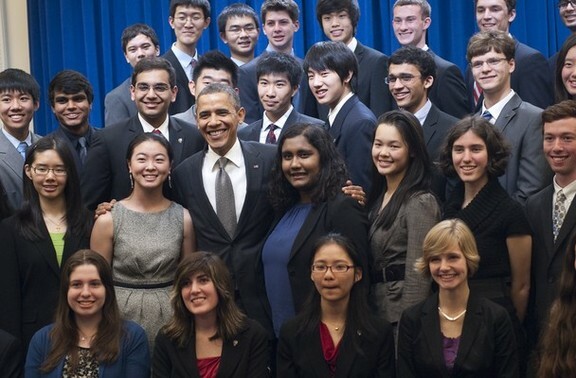 President Obama wore a big smile on his face when he met these talented students. Mr. Obama has repeatedly said that the future of the U.S. economy lies in high-tech fields that are in need of continuous innovations. These outstanding young students will become future high-tech industry leaders. This year’s 40 finalists were selected from the 1839 applicants. Each applicant needed to submit 20-page reports of his or her scientific research, with design documents or lab results, and other supporting documents from teachers and advisers. 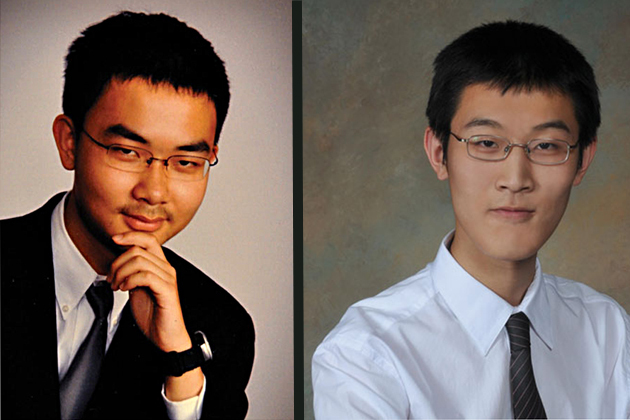 Studying at private Phillips Andover Academy in Andover Mass., Fengning (David) Ding won the fourth place in the final competition, and $40,000 scholarship. Dingfeng Ning was born in Japan, and moved to the United States with his parents at age 7. Scoring points for Mass. public schools, 12th grader Xiaoyu He from Action-Boxborough Regional High School in Acton, Mass. was also among the finalists. He has been particularly interested in mathematics and computer software and games. As a high school sophomore, he was selected as a member of the 2010 US Mathematics Olympiad team. He thanked his parents for their support. According to Intel Science Talent Search, Xiaoyu He contributed to the understanding of rotor-routers as part of his Intel Science Talent Search project in mathematics. A rotor-router is a deterministic algorithm for moving particles in a network according to rules assigned to each node. Using computer programming to inform his intuition, Xiaoyu proved that certain types of rules are universal, in the sense that they can model all other rules, and in the process he gained insight into the symmetries and structure of rotor-routers. Xiaoyu has perfect SAT scores and was awarded a gold medal at the International Math Olympiad in both 2010 and 2011.